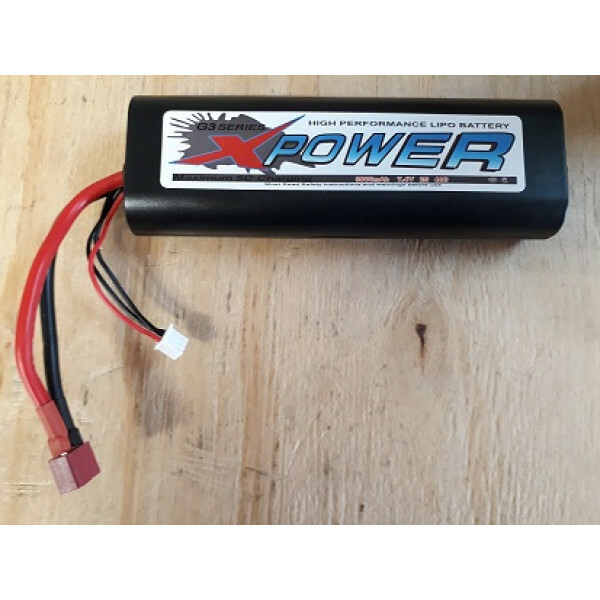 New XPower G3 Series high performance Lithium Polymer (LIPO) battery. these are the Standard Reciever Switches with battery, Receiver and charge lead ..
Deans Style plugs - 1 MALE and 1 FEMALE connectors per pack with plastic sleeves ..
4mm Bullet connectors with polastic housing so you cant connect them with reverse polarity! ..
a soldering stand to make life much easier when soldering wires and plugs. .. Description: SOLD as 1 pair These connectors are made from high-temp nylon with gold-pla.. Description: SOLD as 1 pair Capable of more than 120A continuous current .. Description: SOLD as 1 pair Capable of 60 continuous amps Ergonomic.. Description: SOLD in packs of 3 pairs, with short pig tail leads for connecting to your batt..
12 Gauge Silicone Wire Super Efficient Highly Flexible Sold per Metre..
14 Gauge Silicone Wire Super Efficient Highly Flexible Sold per Metre..
comes in a pack of 2 pairs (2 MALE and 2 FEMALE connectors with plastic sleeves) ..
AC Input voltage100-240VDC Input Voltage11-18VCharge powermax.50WDischarger powermax.5WCharge curren..
18 Gauge Silicone Wire Super Efficient Highly Flexible Sold per Metre..
16 Gauge Silicone Wire Super Efficient Highly Flexible Sold per Metre..
2.0mm bullet / banana connecters for ESC / electric motors - packs of 3 pairs ( male and female) ..
3.5 mm bullet / banana connecters for ESC / electric motors - packs of 3 pairs ( male and female) wi..
4.5 mm bullet / banana connecters for ESC / electric motors - packs of 3 pairs ( male and female) wi..
2.4" IPS Display262K colors Hi-brightness monitor, up to 178°visible angle, brings outstanding displ..
DESCRIPTIONThe ultimate field charger JUST GOT SMALLER which can run off an external power.. Description: SOLD in 2 pairs These connectors are made from high-temp nylon with gold-pl..
Deans Style plugs - 2 MALE and 2 FEMALE connectors per pack with plastic sleeves ..
Deans to EC3 adapters - the simple way to change plugs with no soldering. ..
Plugs - Deans to XT60 adapters - the simple way to change plugs with no soldering. ..
AC Input voltage100-240VDC Input Voltage11-18VCharge powermax.100WDischarger powermax.5WCharge curre.. The CQ3 is a powerful 4x charger. The charger can handle up to 4x different kinds of batteries at th..
4.0mm bullet / banana connecters for ESC / electric motors - packs of 3 pairs ( male and female) ..
6.0mm bullet / banana connecters for ESC / electric motors - packs of 3 pairs ( male and female) wit.. Description: DC Input Voltage 11-18V Charge power max.50W Discharger power max.5W&nbs..
Mini-Deans Style plugs - 2 MALE and 2 FEMALE connectors per pack with plastic sleeves ..
Deans Male to EC3 Female adapters - the simple way to change plugs with no soldering. ..
Deans Style plugs - T style series connector .. Heavy duty switch capable of high amp load applications22 guage wire with gold connectors ..